Imagine a Chocolate Truffle, But really Big, and Really, Really Delicious! Mmm -- Soft melt away chocolate on the inside, with a layer of Dorothy's Swiss with that distinctive bite of fine chocolates! This egg is the one for chocolate lovers! 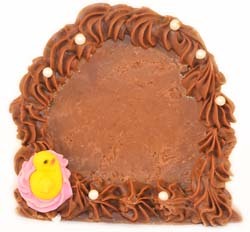 Note: Picture shown is one-half egg with chocolate trim added for display only. "Melt Away" that takes your breath away! From Sue of St. Petersburg, Florida on 3/26/2013 .